In the first 2 articles, we reviewed wine style, related to its personality, and wine quality, “the degree of excellence” at which it compares with others of the same style. “Taste like a pro” aims to delve into the criterions we use when we score wine. 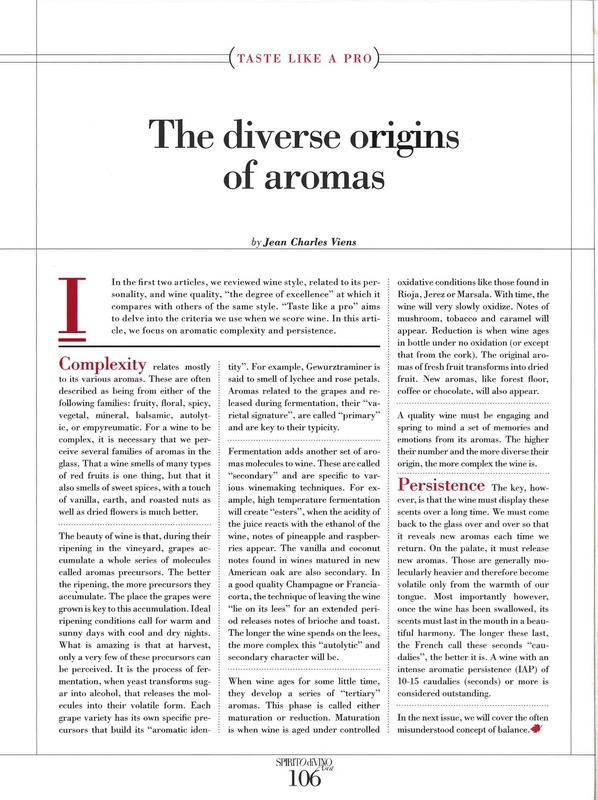 In this article, we focus on aromatic complexity and persistence. Complexity is really what makes more than one wine lovers wax lyrical about wine. It relates mostly to its various aromas. These are often described as being from either of the following families: fruity, floral, spicy, vegetal, mineral, balsamic, autolytic, or empyreumatic. For a wine to be complex, it is necessary that we perceive several families of aromas in the glass. That a wine smells of many types of red fruits is one thing, but that it also smells of sweet spices, with a touch of vanilla, earth, and roasted nuts as well as dried flowers is much better. The beauty of wine is that, during their ripening in the vineyard, grapes accumulate a whole series of molecules called aromas precursors. The better the ripening, the more precursors they accumulate. The place the grapes were grown is key to this accumulation. Ideals ripening conditions call for warm and sunny days with cool and dry nights. What is amazing is that at harvest, only a very few of these precursors can be perceived. It is the process of fermentation, when yeast transforms sugar into alcohol, that releases the aromas molecules into their volatile form. Each grape variety has its own specific aromas precursors that establish its “aromatic identity”. For examples, Gewurztraminer is said to smell of lychee and rose petals while Syrah has notes of violet and black pepper. Aromas related to the grapes and released during fermentation, their “varietal signature”, are called “primary” and are key to their typicity. During fermentation, another set of aromas molecules will be added to the wine. These are called “secondary” and they are specific to various winemaking techniques. For example, high temperature fermentation will create “esters”, when the acidity of the juice reacts with the ethanol of the wine. For examples, notes of pineapple and raspberries. Some, like the vanilla and coconut notes found from wines matured for a time in new American oak are also secondary. In a good quality Champagne or Franciacorta, the technique of leaving the wine “lie on its lees” for an extended period releases notes of brioche and toast. The longer the wine spends on the lees, the more complex this “autolytic” and secondary character will be. When the wine ages for an extended period of time, they develop a whole series of aromas called tertiary. This phase is called either maturation or reduction. Maturation is when the wine is aged under controlled oxidative conditions like those found in Rioja, Jerez, or Marsala. With time, the wine will very slowly oxidize and notes of mushroom, tobacco, and caramel will appear. Reduction is when the wine ages in bottle under no oxidation (or except that from the cork). The original aromas of fresh fruit transforms into dried fruits. New aromas will also appear during this phase such as forest floor, coffee, or chocolate. A high quality wine must be engaging and it must spring to mind a whole collection of memories and emotions from its aromas. The higher their number and the more diverse their origin, the more complex is the wine. The key, however, is that the wine must display these scents over a long period. We must come back to the glass over and over so that it reveals new aromas each time we return. On the palate, it must release new aromas. Those are generally molecularly heavier and therefore become volatile only from the warmth of our tongue. Most importantly however, once the wine has been swallowed, its collection of scents must last in the mouth in a beautiful harmony. The longer these last, the French call these seconds “caudalies”, the better it is. A wine with an intense aromatic persistence (IAP) of 10-15 caudalies (seconds) or more is considered outstanding. 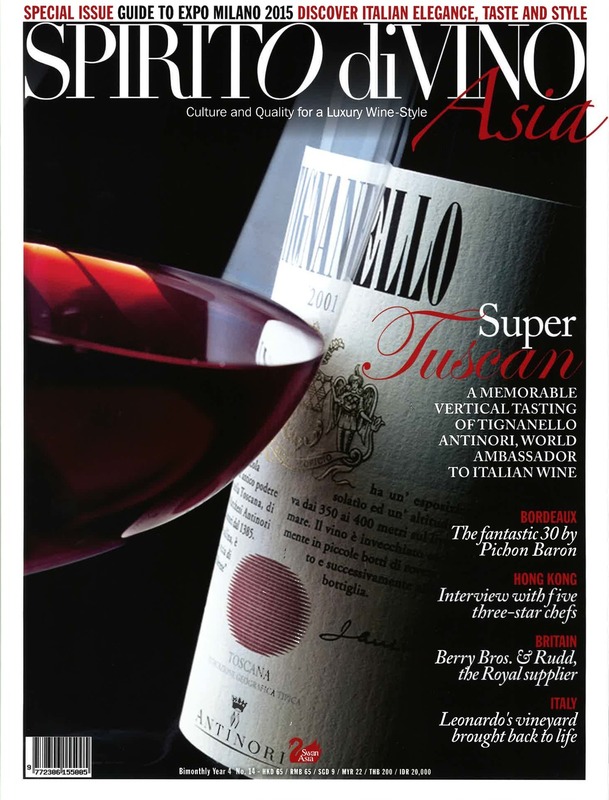 In the next issue, we will cover the concept of balance, often misunderstood, even by many a “wine expert”.